A UNESCO World Heritage site, the “Floating City” of Venice is known for its many canals and bridges. It is a great place to discover art and visit churches. |Bari is a port city in southern Italy. Known for being host of the relics of San Nicholas, Bari is a great destination for anyone looking to visit churches, discover Italian architecture and enjoying good food. A famous cruising destination, Santorini is located on the outskirts of a caldera housing an active volcano. This makes it a great place to enjoy some diving and experience some breathtaking views. Situated in the heart of the Attica region, Piraeus is only 7 miles from Greece's capital city, Athens. The Port of Piraeus is not only the largest port in Greece, but is also the largest passenger port in Europe, and third largest in the world. Corfu is approximately an hour's flight from Greece's capital, Athens. Recognisable for its swathes of olive and pine trees, Corfu is a city of undisputed natural beauty. Famous for its rich culture and historical buildings, Kotor is the Adriatic coastal town of Montenegro. On the UNESCO list of World Heritage Sites, Kotor is known for its picturesque landscapes. Features two single beds. Also includes: air conditioning, bathroom with shower, interactive TV, telephone, wi-fi internet connection (for a fee), mini-bar, safe deposit box. Features a porthole and two single beds. Also includes: air conditioning, bathroom with shower, interactive TV, telephone, wi-fi internet connection (for a fee), mini-bar, safe deposit box. Features a double bed, which can be converted in to two singles. Also includes: air conditioning, bathroom with shower, interactive TV, telephone, wi-fi internet connection (for a fee) mini-bar, safe deposit box. Features a balcony and a double bed, which can be converted in to two singles. Also includes: air conditioning, spacious wardrobe, bathroom with bathtub, interactive TV, telephone, wi-fi internet (for a fee), mini-bar, safe deposit box. Situated on deck 13, The gelato comes in a wide variety of around 16 different flavours from vanilla, chocolate, strawberry, pineapple and coffee to pistachio, kiwi and lemon. With panoramic sea views L’Oasi on Deck 13 within the Sahara Cafeteria, seating 250 guests, offers a gourmet three-course à la carte meal using typical Mediterranean ingredients with a twist with a menu introduced by acclaimed Italian seafood chef Mauro Uliassi. Examples of dishes on offer include Duck Foie Gras, Scallops, swordfish and smoked duck breast, Chilled Cucumber and Mint Velouté, Seared Monkfish Medallions, and New York Strip Steak. L’Oasi opens for dinner only from 6.00pm until midnight. Part of the Sahara Cafeteria on deck 13 becomes a pizzeria at night, from 7.00pm to 10.30pm and serves a selection of pizzas and calzone for a small charge. The ship's Sports Bar, L’Olimpiade, is located on deck 7 and seats 120. It serves an à la carte menu between 10.00am to 1.00am, featuring Steamed shrimp cocktail, Fish & Chips, Buffalo Chicken Wings, and Salad. Other items range from Italian flat bread with Parma ham and mozzarella, Italian Gragnano bread filled with sausage, mushrooms and cheese and prawn curry to French baguette with ham, cheese, egg and salad, mini hamburgers, Spanish, German, Turkish and Chinese dishes. Located on deck 5, serving a wide variety of dishes, prepared by hand with the freshest ingredients, there's a great variety of choice to be had in the restaurants . One of two main dining rooms onboard, guests will find everything from freshly baked bread, to Italian and Mediterranean styled food here. Oriental Plaza on deck 7 is a small intimate speciality à la carte restaurant seating 54 guests in a room decorated with deep gold, black lacquer, floral prints and dragons. Serving a range of dishes from Chinese, Indian, Indonesian, Thai and Japanese delicacies, such as Hot & Sour Soup, Ming Combo - 4 Pieces of Dim Su, Tang Combo – 16 Pieces of Dim Sum, Chicken and Rice, Cantonese Style Sweet & Sour Pork, Stir Fried Beef with Bamboo Shoots, Mu Shu Pork, Stir-Fried Beef in Oyster Sauce , Prawns in Black Bean Sauce, Garlic Scallops , Fried Ice Cream, Rice Pudding with Candied Fruit, Banana Spring Rolls. Sahara can accommodate 472 guests and is located on deck 13. It is the ship's self service buffet restaurant serving breakfast and lunch in a casual environment. It features an omelette station, a sandwich bar, pasta station and a grill that serves hamburgers, hot dogs, and other favourites along with a desserts section. Open from 6.30am for an Early Birds Coffee, the breakfast buffet is served between 7.00am and 10.00am. Lunch is served between 11.30am and 3.30pm and afternoon tea from 4.15 to 5.00pm. During the cruise a number of midnight buffets are served from 11.30pm to 12.30am in a variety of locations, including the Sahara Cafeteria, such as a Mediterranean Buffet. Quattro Venti, located on Deck 6, boasts a top gastronomic selection thanks to the variety of dishes and the high quality of the foods, from choice Italian meats, scrupulously controlled, to fresh fruit. Every product is fresh and carefully handled, such as bread baked on board with the passion and knowledge of the most distinctive boulangerie. Dishes range from traditional and tasty Mediterranean fare, to the most refined international recipes. The Poker Room is located within the casino on deck 7, and seats 28 guests. It is a separate card room for Texas Hold’Em games. Magnifica’s 4D eight seat cinema, with 3D graphics and moving seats to enhance guests experience, is located on deck 14 and costs around €7.90 per viewing. Ten pin bowling is available in T32 aft of deck 14. The bowling alley is designed for maximum entertainment and impact, including a traditional-looking bowling surface made of a tough phenol compound which allows guests to enjoy a game without changing shoes. The alleys are scaled down to work within the area and the bowls themselves are smaller than usual, making them more manageable for youngsters. The alley also incorporates two large LCD electronic screens featuring interactive videogame animations with a choice of Ten Pin Tour and Turkey Shoot. The bowling is operated by tokens, priced at around €5 per game, which are available from reception on deck 5, the adjacent 4D cinema, within the T32 disco itself and from vending machines. The ship's card room is located on deck 7 and seats 28 guests. The Cyber Cafe located on deck 7 is the ship's computer room with 17 workstations and a printer (Charges apply). L'Ametista Lounge is located on deck 7 of the Magnifica and has its own bar and dance floor along with seating for 330 guests. It is a large cabaret style lounge with live shows and bands for guests' entertainment. The Tiger Bar is the ship's second show lounge served by its own bar and dance floor. It is situated on deck 6 with seating for 477 guests. Entertainment and activities range from bingo, seminars, Italian lessons and salsa dance classes to audience participation game shows, karaoke and international dance music. There are a variety of shops and boutique onboard. From the MSC Logo shop that sells MSC clothes, souvenirs and toys, Le Parfum selling a range of cosmetics and perfumes including Dior and Marc Jacobs. La Boutique, on deck 6 sells men's, women's and children's fashion with brands including Polo, Ralph Lauren, Lacoste and Armani, with sunglasses, watches and fashion jewellery. The ship's Photo Gallery on deck 7, displays photos and videos of guests taken by the ship's official photographers which guests can purchase if they wish to. Guests can also have portraits taken with a selection of backdrops or locations throughout the ship. The ship's small library and reading room are located on deck 7, with seats for 15 guests. It has a small selection of books in a variety of languages for guests to borrow. It also contains a number of board games for guests' use. The Art Gallery can be found on deck 7 of the ship. Guests can view a range of artwork from fine prints, lithographs, water colours and oils which can be purchased during the ship's champagne art auctions. L’Olimpiade on deck 7 with seating for 120 guests, is the ship's themed sports bar serving an à la carte snack menu. It features large TV screens airing a variety of sporting events and pool tables for guests' use. Magnifica’s Coffee Bar is located on deck 5, midship with seating for 142 guests and music ranging from Latin to classical, drinks on offer range from chilled liquor based coffees such as Espresso Martini, American Style Coffee, Cappuccino and Hot Chocolate. The Ships cocktail bars are the ideal location for guests to enjoy a pre-dinner cocktail with live musical entertainment. They are located on deck 6 with seating for up to 45 guests in each bar. The ship's smoking room and whiskey bar is situated on deck 7 and seats 32 guests. The Cigar Lounge offers elegant surroundings with leather settees and armchairs for guests to relax on and enjoy a cigar accompanied by a drink selected from the range of fine spirits on offer. 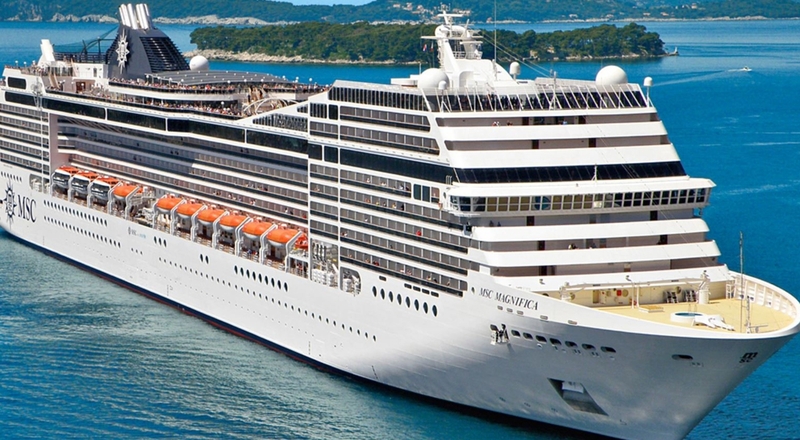 State of the art theatre, and the main show lounge onboard, with seating for 1,240 people, it is home to MSC Orchestra’s shows ranging from singers and jugglers to shadow puppeteers and acrobatic gymnastics. It is split over two levels of seating on Deck 6 & 7. With a live DJ and open from 11.00pm until late, the ship's disco located on deck 14 and served by its own bar. It has seating for 172 guests. The ship's 630 square meter casino, situated on deck 7 accommodating 222 guests. It is served by its own bar and features games from roulette and blackjack to poker and slot machines. The Casino is open to over 18’s only. An onboard arcade, with a variety of video games and digital options. Open to all children onboard.